This class continues from where you left off in Beginning Jewelry Fabrication Part 1 or for those with some prior experience. 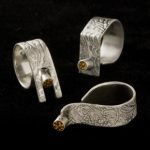 Building on the foundational skills from Part 1 you will become more familiar with working in metal, planning your designs, making bezels for stone setting, and more advanced training in soldering. $35 payable to instructor includes all materials.